Collaborate to build civilization in a simulated ecosystem, creating laws to make group decisions. 4,583 backers pledged $202,760 to help bring this project to life. where you must collaborate to build civilization in a finite shared world, using resources from a fully simulated ecosystem where your every action affects the lives of countless species. Will you and your fellow citizens collaborate successfully, creating laws to guide the actions of the group, finding a balance that takes resources from the ecosystem without damaging it? Or will the world be destroyed by short-sighted choices that pollute the environment in exchange for immediate resource gains? Or, do players act too slowly, and the world is consumed by a disaster that could have been avoided if you developed the right technology? In Eco, you must find a balance as a group if the world is to survive. Eco is a survival game in a global sense, where it is not just the individual or group who is threatened, but the world itself. The world of Eco will be home to a population of thousands of simulated plants and animals, each living out their lives on a server running 24 hours a day, growing, feeding and reproducing, with their existence highly dependent on other species. and things get complicated. It is the role of players to thrive in this environment by using resources from the world to eat, build, discover, learn and invent. However, every resource they take affects the environment it is taken from, and without careful planning and understanding of the ecosystem, lands can become deforested and polluted, habitats destroyed, and species left extinct. In the extreme, the food supply of the ecosystem can be destroyed, along with all human life on it, resulting in server-wide perma-death. Eco is a game where the player’s actions have meaningful consequences. Taking resources from an ecosystem to build within it without destroying it is no easy task, and you’ll need to make decisions as a group to do so. Fortunately you’ve got some tools to do so. Players can propose, discuss, and vote on laws, and passed laws will affect everyone, physically preventing them from breaking the law. 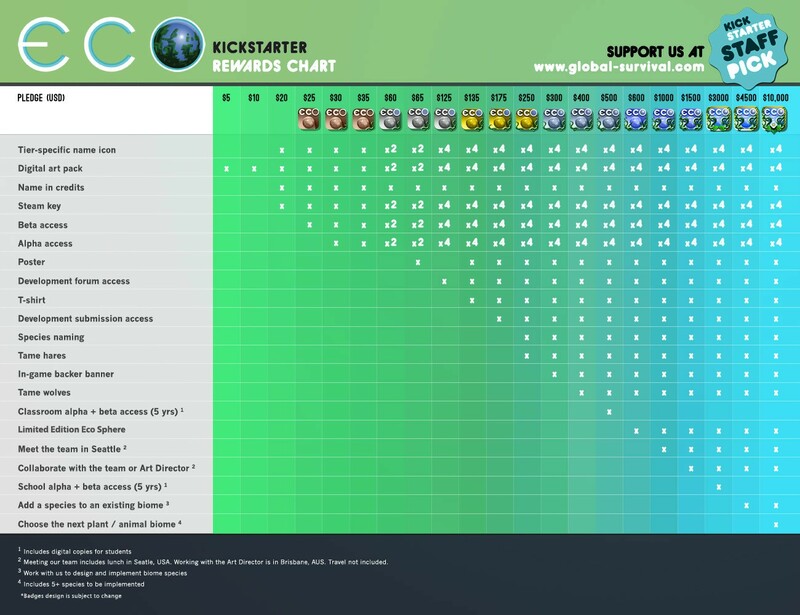 The ecosystem data is visible to players. 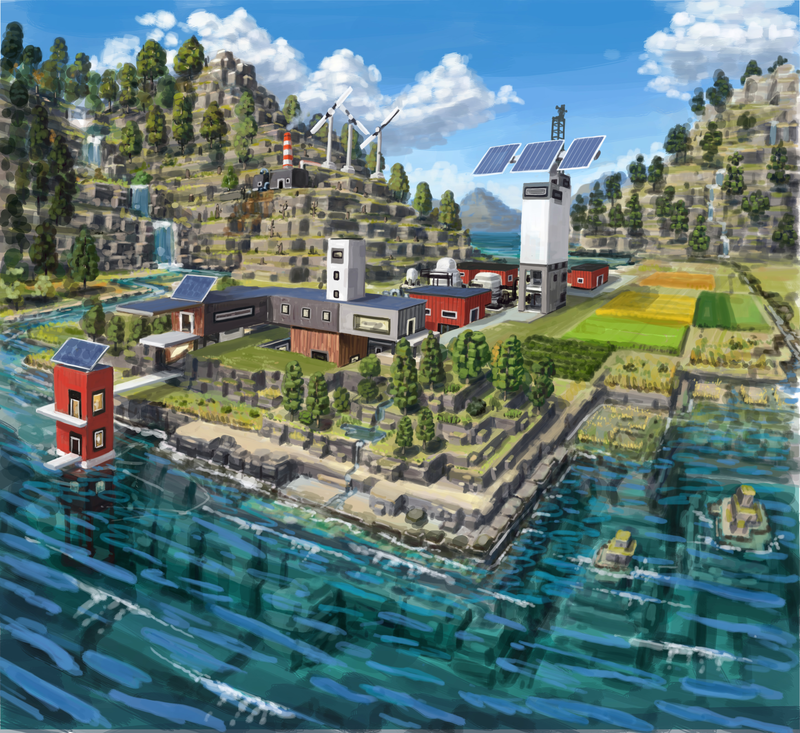 Players can gather full data on the ecosystem simulation in-game, allowing them to analyze what’s happening in the world and how the ecosystem works. This data can be used to construct arguments for laws, backing up the player-run government with hard scientific data. Eco is a voxel world that can be completely transformed as players mine and build, and unlike other voxel games where buildings are purely decorative, buildings will have effects in Eco. When a player constructs a building, they can designate its type (whether its a home, school, lumber mill, bakery, etc). If it meets the criteria (size and construction material) it will then give special abilities to anyone who occupies it. For example, players who construct a home will see their food depletion rate go down by 70% if they logout inside it. Other buildings will be required to process resources (lumber mill, bakery), provide access to tools (mine, well) or increase the rate skills are learned (school, library). Unlike other voxel games, building will be a complex task in Eco, requiring a range of skills from multiple players to construct. Resources must be harvested (wood cutting, masonry), processed (wood working), transported (animal labor), and constructed (carpentry, construction). It will not be possible for one player to specialize in all the skills necessary to build in Eco, collaboration is required. This emphasis on collaboration within Eco creates many interesting multiplayer effects, as players choose skills to specialize in. The only way to have work done across multiple specialties is to collaborate, and all high-level goals in Eco will require multiple types of skills. Supporting this will be a player created economy which players can use to sell goods and services. Unlike most games which only allow players to sell items, Eco allows players to sell contracts for labor, which the game will enforce. Need someone to build you a house? Take out a contract and they will complete the job, with payment being held in escrow until completion. This system of contracts forms our 'quest' system, where a quest is an actual job needed by another real human in the game, which your player has the specialized skills necessary to complete. Through specialization and game-enforced exchanges and contracts, a rich economy will develop in Eco that forms the basis of all resource allocation. Players will have skills in a variety of areas that determine their abilities in the game, and a single skill be increased at a constant rate of time. This rate is multiplied by how healthy and well-fed a player is, thus raising the need for an agricultural industry within the world. While most games treat food as something you must simply top-up periodically in the game, Eco ties it to skill advancement, so the nutrition of the food you eat determines how fast you increase in skill. Eat very little or only junk? Your skills will remain stagnant. Eat high quality and nutritious food? Your skills will raise at a multiplied rate. Players who specialize in skills related to food harvesting, farming, and preparation, and then give or sell that food to their fellow players will have a tremendous impact on the overall skill rate of players and thus survival of the world. Food is not an after thought in Eco but a key industry required for success, and tied deeply to the ecosystem from which it must be harvested, making farming and hunting as well as food processing and preparation pivotal skills. Players begin the game with just a few technologies and buildings they can access. To acquire more, they must perform research. Players research by performing experiments, an action they can do in the game in special buildings with specific tools that will consume resources. Multiple players can contribute experiments to a common cause, and when enough experiments have been performed a knowledge object will be unlocked. Knowledge objects are owned by those that performed the research, and they may be shared for a price or freely to anyone they wish (they never get consumed), with each player using a knowledge object getting access to new skills they can train, new buildings they can construct, and new research they can take on. As players gain in knowledge they gain in power, with players in a fresh world starting off relatively weak but growing to have the capability for huge influence on the world and ecosystem, which can lead to triumph or ruin depending on how they use those abilities. As the level of technology available to players increases, the capability for affecting the environment increases exponentially. To ensure players use this power positively, players must construct laws. Players can propose laws backed by scientific data they take from the ecosystem, using sophisticated graphs and wiki toolsets to make discussions and decisions about the future of the world a seamless activity for players. There is no guide book to how to sustainably use the resources of the ecosystem, players must understand it by looking at the actual data themselves, and convince their fellow players of what they believe. 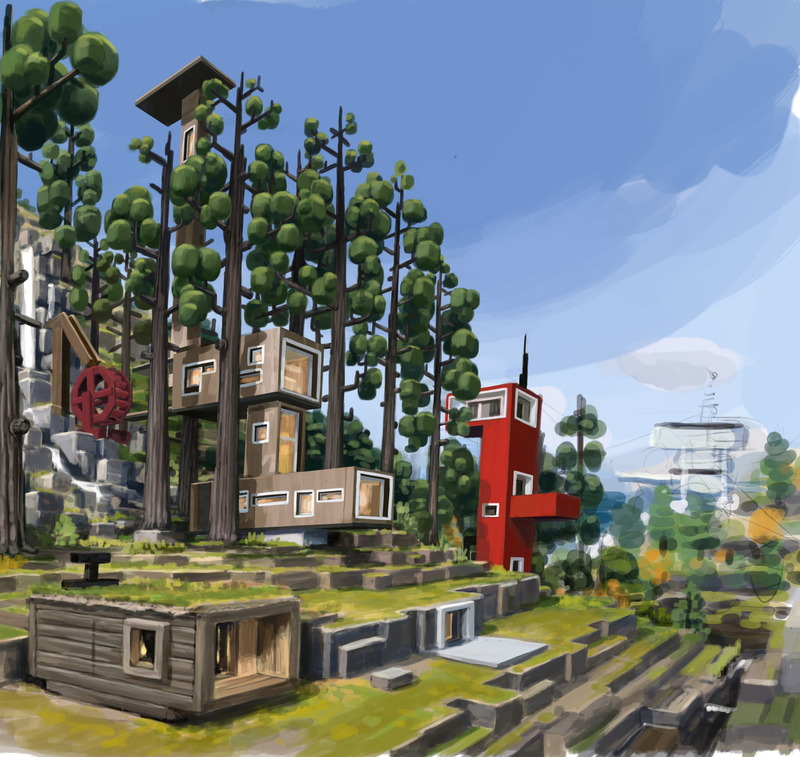 As players have different specialties in the game, their incentives will be influenced heavily by their livelihood, just as in the real world (a lumberjack player may be less inclined to halt deforestation than the general population because their livelihood depends on it). Thus, even though players are working together towards a common goal, their individual incentives and desires will guide their decisions in conflicting way, and navigating that Tragedy of the Commons through laws and scientific evidence to achieve success and avoid ruin is the core experience we plan to provide with Eco. Besides the threat of destroying the ecosystem of the world through pollution and habitat destruction, the world of Eco is threatened with another catastrophe, set via options at server creation. A meteor may be striking the earth, with the groups only chance of survival to develop technology to prevent it. Or a drought may be imminent, and food and water must be conserved in anticipation. Global warming may be raising the sea levels, and players will have to adapt. In Eco, the threats to the world’s existence are not only internal (player destruction of the ecosystem) but external as well, giving players an additional incentive. There is no easy moral lesson here, and entirely avoiding harm to the ecosystem in Eco is not a solution, resources must be collected from the world at the short term expense of the ecosystem if it’s going to survive in the long term. These will be expert scenarios that only a large well-governed group of players will be able to overcome . Players will be able to host their own servers, and the game can be played single player if so desired. The size of the world can be scaled, and the rate of learning increased in these scenarios so players can try their hand at building on their own in an isolated world, surrounded only with plants and animals of the wilderness. We want to build Eco into more than just a single game, but a platform for many experiences. From alpha access onwards, we will have full modding support, with a modding API. Mods will be well-integrated into the final game, with downloads happening automatically, sent from each individual server. We intend to open up the technology we're building to create a new class of game: large, dynamic, multiplayer worlds with continuous simulations running, in which the physical, social, economic, and government structure are all under player control. The possibilities for games like this is barely explored, and with Eco as a platform we can provide a launch pad for creating them. With Eco funded, we can start thinking about stretch goals! Our first stretch goal at 150k is a land ownership system, taxation, building rights. Read about it in this update. Our second stretch goal has changed! At 200k, we will implement a Player-Run Criminal Justice System. Check it out in this update. This is game we plan to develop in close tandem with a community of players, and shortly after the Kickstarter completes we will open the game to backer-only early access. Backers at the appropriate tiers will have full access to all aspects of development, with an open Trello account detailing what each team member is working on, open source art and code for most of the game, and the ability to host your own server. We will rely on our backers to give feedback on the mechanics as we develop them, playing a pivotal role in the creation of the game. Additionally, Eco will have very fully integrated modding support, with drag-and-drop plugin support while the server runs, and a web-interface for configuring a running server. Multiplayer server hosting a voxel world, supporting up to several dozen players simultaneously. Dynamic simulated ecosystem featuring 10 species of plants and animals that runs tens of thousands of organisms simultaneously in real time, each feeding, growing, hunting, fleeing, and reproducing using AI behaviors. Following the Kickstarter, we will make a version available for alpha-tier backers for our alpha test, targeting October. Players will be able to host their own worlds and participate in development. Service sales, allowing players to sell contracts to perform services using their specialized skills (quest system). Over the course of the next 16 months we plan to develop the game extremely closely with the community, integrating their feedback and contributions at every step. From there we plan to extend the game and continue adding support for players and modders, fostering a community of development surrounding the game. Our team is composed of game industry veterans, from the studio that created the liquid physics game Vessel, the cell biology game Sim Cell. Team members have more than a collective 50 years experience in the games industry, including projects like Lord of the Rings on PlayStation, the Dark Knight for console, the Microsoft Holo Lens, and dozens of other console titles. Our team has a solid history of delivering extremely technically challenging projects on time and budget. John Krajewski - Project lead and designer of Eco. Prior to founding Strange Loop Games, worked as Lead AI Programmer at Electronic Arts. Programmer of the liquid physics simulation of Vessel. Also served as project lead on Sim Cell, Codebreakers, Scribbly Wits. John's focus is on programming and designing for detailed simulations (AI, Physics, Ecology, Social, etc). Milenko Tunjic - Art director. Founder at Strange Loop, Milenko has been art director on every project we've shipped, and has more than 20 years experience in the games industry. Eric Anderson - Tech director. Prior to Strange Loop, worked as a technical developer on the Microsoft Hololens project. Winner of the 2004 IGF for Bontago. Eric comes from a long history in the console and PC games industry, including Surreal/Midway/Warner Brothers with numerous titles shipped. A team at the University of Illinois helped us create the prototype and design and build a simulated ecosystem model. Going forward we will be working with other partners for performing research, science design, and testing on Eco. Eco is an extremely community-focused game, and by going with Kickstarter for our funding we place that community at the center of development, and work directly with them to make the game a reality. We've already been Greenlit on Steam after only 8 days, and we plan to support the game through the Steam platform for both alpha and beta testing as well as the final product. Backers can add value to their pledge to purchase additional digital copies, for every $35 additional they pledge above their tier they will receive an additional alpha/beta copy. We believe games are the most powerful medium of our age, and that by playing Eco players will have an experience that will be incredibly meaningful in how they think about the finite resources of our actual environment. For that reason, we plan to build Eco with special support for classrooms, including a set of tools for teachers to get a high-level view of exactly what is happening in the game and foster discussion. The game functions as 'homework' with the whole class logging into a shared world form home to build and collaborate, and using the classroom time as the council meeting, where discussions and decisions about this shared world take place. Below is a video detailing the prototype we built and tested for classroom use and used for our grant application, featuring a partnership during the prototype with the University of Illinois Urbana-Champaign. Going forward we will be continuing research and testing with other academic partners. We believe games have the potential to make a huge difference globally, and that the power of play can transform the world. We hope you agree and support our goals as we work to redefine what games can be. - Difficulty scaling 100+ users. If this stretch goal is achieved we plan to tackle this by splitting the server into multiple areas and running them connected. We will collaborate with middleware companies that offer existing technology for hosting massive worlds. - Ecosystem balance. Creating a balanced ecosystem where each individual is simulated is a challenge, but our team is very experienced with simulations, having created multiple physics and AI simulations, and we will continue to work with ecologists to guide development using ecological principles. We plan to develop the server such that time can be run in fast-forward, allowing us to rapidly test and iterate on ecosystem design. - Player interactions. The quality of the game relies on group interaction, and that will matter a lot on who you're playing with. We have experience designing a player-generated-content game Scribbly Wits and managing trolling users to create a strong and positive community, and we will apply the same principles to Eco. Furthermore, through the law-creation feature of the game players will be able to define what is allowed within the group themselves and what punishments should be given to those that break the laws. Like any project, there will be issues and challenges that come up, and through our open development we plan to work these out with the community, seeking feedback with each change. Our company has a history of taking on very technical challenging projects, and with the support of the Department of Education (which gave us a grant to develop the game) we have shown we can deliver on the foundations of the game on time and budget. This Kickstarter will finish the job, bringing the full vision of the game to a large audience. A huge thank you as a supporter of video games with purposes beyond entertainment. A digital art pack of Eco concept art. A huge thank you and your name in the credits as a supporter of video games with purposes beyond entertainment. A discounted steam key of the game, delivered at launch (estimated full price $25) and an icon next to your name in the game as a backer. A steam key of the game with beta access, and an icon next to your name in the game as a beta backer. Early-Bird tier! A digital copy of the game with alpha and beta access. (Steam key) An icon next to your name as an alpha backer. A digital copy of the game with alpha and beta access. (Steam key) An icon next to your name as an alpha backer. Two-person package, 2 digital copies of the game with both alpha and beta access. Two-person package, 2 digital copies of the game with both alpha and beta access. A poster of Eco concept art. 4 digital copies of the game all with alpha and beta access. Membership on the development forums. 4 digital copies of the game all with alpha and beta access. Membership on the development forums. A limited-edition Eco T-Shirt. A poster of Eco concept art. Developer Tier. You will get access to source code and art assets to the gameplay aspects of Eco and be able to submit changes for review and possible integration. Direct connection with the team and ability to chat with them and share task planning. Includes previous tier. Animals of your chosen species will have a percentage chance of having a name you specify (must be approved). Your character will be able to tame hares as pets. Includes previous tier. You will have the unique ability to craft an Eco banner listing yourself as a top supporter of the game. Includes previous tier. Wolf Tier - you will have the unique ability to tame a wolf in the game, available only to top backers. Includes previous tier. Eco Classroom Tier - A digital copy of the game for every student and teacher in a classroom of your choice. Students for the next five years in that class will receive the game for free. Students will have the option to alpha/beta test the game as a group and participate in the development, listing their names in the credits if desired. Eco Sphere Tier! Receive a limited edition self contained Ecosystem in a sealed glass container, a mini food-web that survives on sunlight alone. This will be a reward for top-backers only, shipping is free. Includes $400 tier. Eco-friend Tier. Meet the team in Seattle, Washington and discuss your ideas face to face for 1 day including lunch (travel not included). Participate in the overall design of the game. Includes previous tier. Eco-design Tier. Spend the day pair-developing with Eco's designer John Krajewski and Eco's tech director Eric Anderson in Seattle Washington. Travel not included. Includes $1000 tier. A permanent digital copy of the game for every student and teacher in a school of your choice. Students and teachers for the next 5 years will all receive free copies. Schools will be given the option to alpha and beta test the game, collaborating directly with the developers and listing their names in the credits if desired. Global Change Tier. Choose an entire biome we will implement, including a full set of at least 5 simulated plant/animal species (must be based on an actual biome, must come to agreement with dev team). Participate in the artistic and behavioral design of the species face to face with the team over a 5 day period. Special top listing in the credits as a primary backer! Includes $4500 tier.